Energy insiders have been talking up ‘smart grid’ for about a decade, but most regular people still don’t recognize the term – unless they’re from Ontario, that is. Smart grid awareness runs high in the Canadian province because almost every household and business there now has a smart meter – 4.7 million in total. And Ontario’s government isn’t stopping there. With a $50 million budget, the Ministry of Energy this month launched a search – its second – for smart technologies to fund. During a July 10 web presentation, Ontario’s Ministry of Energy detailed the new smart grid opportunity – and offered several tips to help companies position themselves to win the money. If you plan to seek funding, note that applications are due Sept. 6. And be aware that more than 200 people signed up for the July 10 presentation, so competition is likely to be intense for the money. How much money will Ontario allot this round? The ministry hasn’t set a firm figure. But more than $35 million remains on the table following last year’s allocation of $14.1 million for nine smart grid projects. The ministry offers the funding as a way to leverage private capital. Ontario’s initial $14.1 million resulted in more than $100 million in private investment. That amounts to $7 in private money for every $1 of public funds. To be eligible for funding, a technology must be close to commercialization. The funding is meant to give the technology a final push into the pilot or demonstration stage, according to Smith. Projects cannot be early stage research, nor can they be ready for full-scale rollout. The province seeks two kinds of projects: 1) capacity building; and 2) demonstration. Money for capacity building projects might be used to acquire smart grid assets and put them into operation, or boost the manufacturing of products that improve energy efficiency. Project budgets must be no less than $500,000. Demonstration projects must be conducted in partnership with utilities, energy transmitters or grid operators. The idea is to show risk-adverse utilities that smart grid technology works. The province will select demonstration projects that advance prototypes, identify risks, integrate technology with Ontario’s electric grid, achieve scale, and align smart grid with the province’s energy efficiency goals or other policy priorities. Project budgets must be no less than $250,000. In both categories, the province will fund up to 50 percent of the cost. Projects can run for up to two years. Applicants must be in Ontario or plan to establish operations in the province. They can be businesses, non-Ontario government agencies or universities and colleges (which are newly eligible this year). Smith noted that Ontario has yet to attract projects for microgrid, energy storage or electric vehicle integration – all technologies that Ontario would like to help. The ministry encourages applications from this type of project – although it will offer them no special preference in the selection process. The ministry also encourages projects that involve collaboration among various parties. Utilities are being invited to participate in this round of projects as non-lead partners; they could not participate in last year’s solicitation. Utilities are eligible for up to 50 percent of funding. Last year’s winners were: Ecobee, Energate, Enbala, IBM, Prolucid, N-Dimensions, Essex Energy, dTechs, General Electric’s Grid IQ Centre. Detailed application guidelines are here. 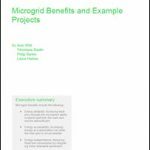 What Will Keep Microgrid Development Trending Upward in 2016?